OK, I admit it. I’m a closet strategy gamer. Set me up on Total War, Age of Empires or DEFCON and you won’t hear from me until supper time. 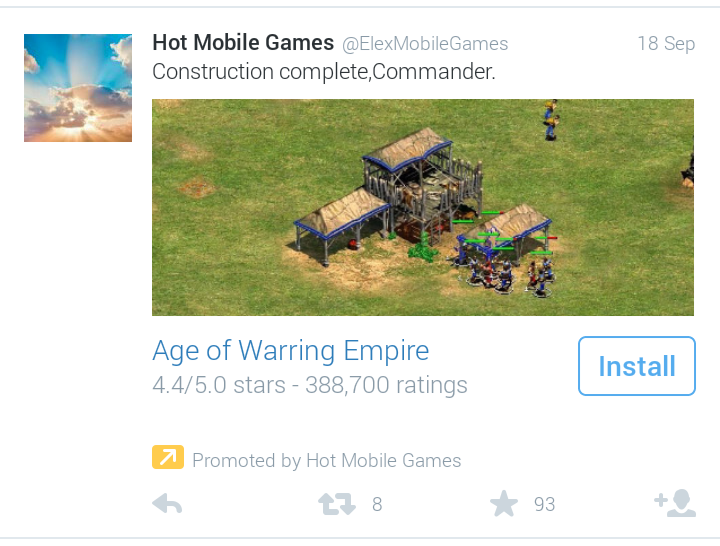 It’s clearly not a screenshot but an illustrative image, like the type you’d see advertising a Hollywood movie. There isn’t a problem here. Nobody would imagine the game looks like that. But to use another title’s in-game graphics to advertise your own app seems to be dishonest, even if the general theme of the game is similar and they both appeal to similar audiences. War is not so much a matter of weapons, as of money. It’s not beyond credibility that some of these titles (especially Age of Kings, which was released in 1999 and required 32MB of RAM and 300MB of disk space and ran at 800×600 pixels) could well have had their rights bought and been ported to Android. Anyone who has played the games knows exactly what they are. 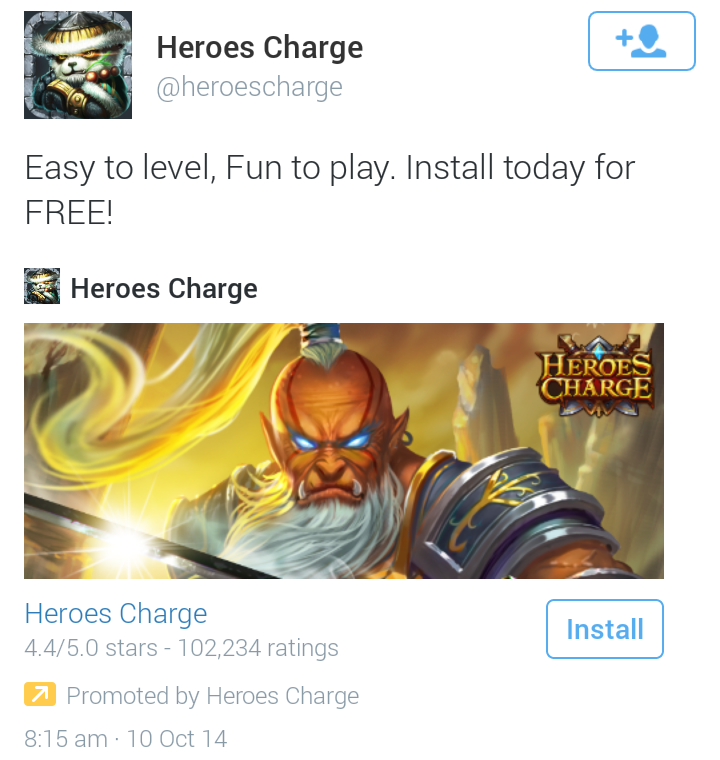 Some have downloaded the apps and found themselves looking at a completely different game, featuring in-app purchases. Ludum pecuniam exiguus detesta matribus. In-app micro-purchases, the dread of mothers. To those of you considering rushing headlong into a strategy, hold your horses. The thing with promoted tweets is that they allow responses, just like any other tweets. 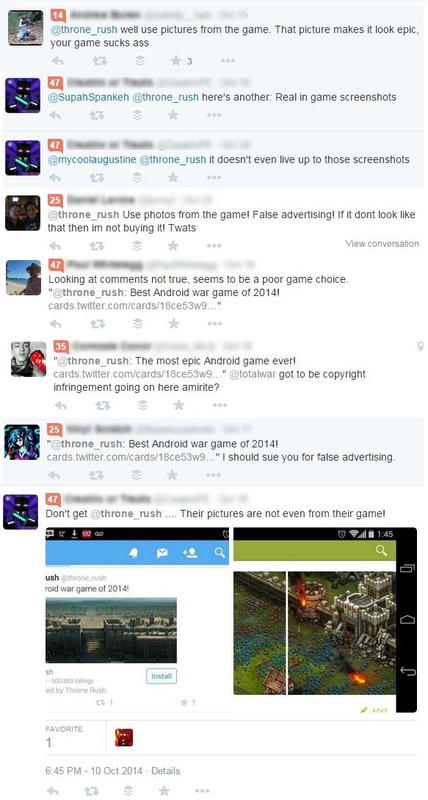 And the responses to these ads are (almost) unanimous in their condemnation. A people’s voice is dangerous when charged with wrath. If a potential customer taps on your ad card and reads a column of vitriolic responses, you’ve probably lost a sale – and paid for the privilege. I came, I saw, I uninstalled. Advertising has never been noted for its self-effacing honesty. Have you ever eaten a hamburger that looks like its picture? But then burger joints have never historically listed the angry responses of their dissatisfied customers. And most nations have some sort of trades description legislation to protect consumers. 2. 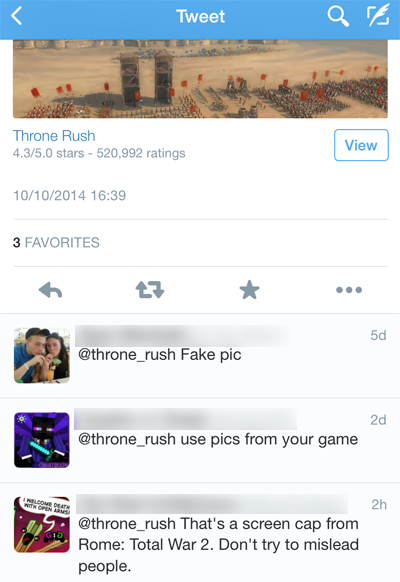 Promote honest content and target it responsibly. Advertisers are responsible for the authenticity of promoted content. Be honest with both the content of your ads and how you target them. Do not select targeting criteria that could reveal sensitive information about users. Don’t subject users to advertising that isn’t relevant to your brand or product. While we’ve focused on one particular product here, that isn’t really the point of this post. Surely there’s a wider point to make about the credibility of Twitter as an advertising platform if it becomes easy to abuse. We’ve pointed out before that Twitter, thanks to its intelligent use of targeting to deliver relevant ads to individual users, can deliver magnificent returns on investment for advertisers – engagement of up to 5% isn’t unusual, which might not sound like much to the untrained marketer but which is impressive in terms of online advertising. But this will only last as long as Twitter is a place where users can trust that the ads they’re following up will be honest. Advertising on Twitter is still relatively new; hopefully the network will realise that it already has a platform that can generate vast revenues while maintaining quality and integrity. Or perhaps the problem will sort itself out through natural selection as stung users teach themselves to use the responses to the ads as a barometer and stay away. An adversary is more hurt by desertion than by slaughter. 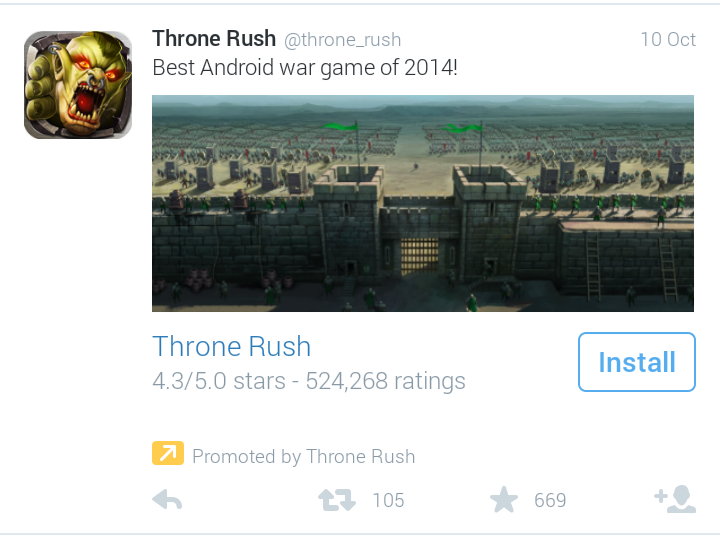 Twitter Ads can be reviewed prior to running in campaigns. They are submitted for approval on an automatic basis, based on an account’s advertising status, its historical use of Twitter, and other evolving factors. Review generally takes into consideration how an account uses Twitter, its profile, and content and targeting included in any active or draft advertising campaigns. It seems like paid social (or at least some of those who are newer to the paid advertising concept) could be in the Wild West of online advertising as all the platforms are still looking for their trusty sheriff to chase all these online outlaws off their ranches! Certainly from a PPC point of view there are strict rules governing this type of behaviour and while there maybe the odd cheeky blighter who slips through the net, this is largely very well enforced and monitored. The other aspect to consider is, is this even wise? The whole concept of paid advertising is that you entice people to click your ad based on it being a relevant answer to the search they have just typed into their search engine of choice … this, of course, costs money, hence the reason for it being called paid advertising. So if you are then presenting them with a product, service etc. that they neither searched for nor wanted in the first place, there is a high likelihood that they will leave your site rather swiftly, most likely without parting with any of their hard earned cash!